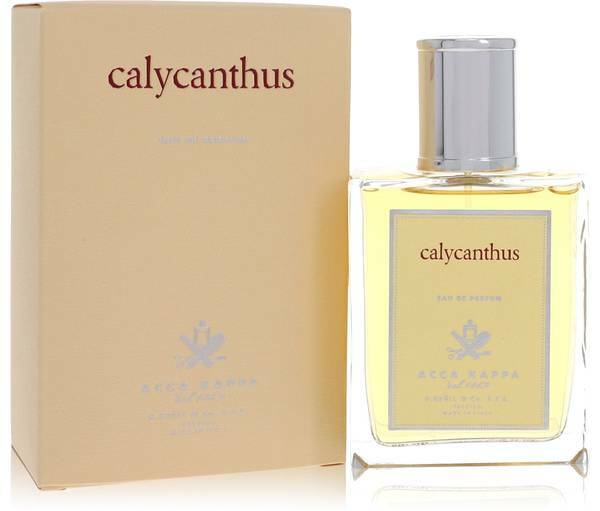 Calycanthus Perfume by Acca Kappa, Calycanthus is a pale gold and purple winter blossom . A white floral bouquet of cyclamen, peony, jasmine, neroli, and orange blossom gather around the predominant note in this perfume. A sweet heart of honey and peach softens the floral top notes and a base of grasses, musk, and pine. This fragrance has moderate longevity and sillage. Acca Kappa was founded in 1869 by an artisan brush-maker and was a long-time supplier to the British Royal Family. In the late Read More Read More twentieth century, the brand began selling personal care products and fragrances sourced from natural ingredients wherever possible for an authentic experience. A clear rectangular glass bottle with a chrome cap bears a pale yellow label evocative of the color of the blooms that characterize this fragrance. The name and crest of the brand are printed in white over the name of the scent in vibrant purple. This fragrance launched in 2003. All products are original, authentic name brands. We do not sell knockoffs or imitations.